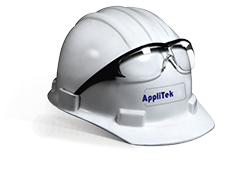 Deeply rooted into the process industry, AppliTek has extensive experience with a vast choice of pretreatment techniques. We not only know how to handle and pretreat liquids but also slurries, powders and gases. Examples of these are found at customers worldwide that rely on AppliTek’s vast know-how in sample preconditioning, ensuring that the samples are easily and reliably fed to the process analyzers. Individual concepts for analysis of either liquids, gases and powders require individual measuring solutions. Therefore we are able to modify our existing standard systems, or to engineer a new and unique preconditioning panel in accordance to your specs. Since AppliTek has its own workshop for manufacturing the analyzer system, it comes completely pre-fabricated and tested to the site without interfering your daily operations.